A thermostat is one of the most inconspicuous components of a home’s HVAC system that is easy to take for granted. A perfectly programmed thermostat places your home’s climate control at your fingertips, making a world of a difference not only in the comfort of your living space but also in its energy efficiency and subsequent electricity costs. Living in an area where the July highs can soar to 85+ degrees while January lows can plummet to below zero means your home must be equipped to deal with both searing heat and freezing cold. And yet, even the most reliable system cannot function at its full potential without the precise, energy-saving control of a thermostat. 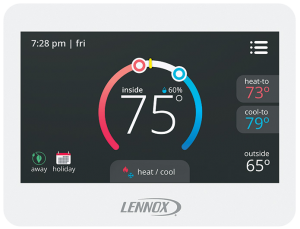 We are proud to introduce a complete selection of programmable thermostats, exclusively from Lennox – the industry leader in home climate control. Our iComfort® and ComfortSense® thermostat series are specially designed for minimized energy use, yet maximized home heating and cooling. With built-in comfort control, our products have the capability of increasing energy efficiency while you are away and, in anticipation of your return, creating your ideal indoor environment. Cloud connectivity that provides full control of your home’s temperature from anywhere via your smartphone or tablet. Touchscreen and button-control with energy-saving programming, with 7-day or 5-day + 2-day scheduling options. Temperature maintenance to within 0.5 degree of your chosen setting – when installed with advanced equipment from the Dave Lennox Signature® Collection. Simplicity, comfort, and smart energy. What could better equip your home for any and all weather conditions than a sophisticated thermostat? Through our simple, yet highly efficient designs, you can make the most out of your HVAC system year-round! If you would like to learn more or experience the difference of our thermostats in Jackson or surrounding areas, please contact us at Jackson Hardware Heating & Air Conditioning today at (262) 677-3477. When you seek state-of-the-art thermostats in Jackson, Grafton, Cedarburg, Mequon, West Bend or elsewhere in Washington and Ozaukee counties, look no further than Jackson Hardware Heating & Air Conditioning. Lennox-trained & certified, we are dedicated to our customers with 24-Hour Service on all brands. With Jackson Hardware Heating and Air Conditioning, customers save money with no flat-rate service fees. Save money today by hiring a heating specialist who charges by the hour instead of a “flat rate book price”. We NEVER take advantage of you by artificially inflating time – our motto is complete transparency and honesty with customers.